On the morning of 26 August, the Germans arrived and heavily attacked II Corps (General Sir Horace Smith-Dorrien). Unlike the Battle of Mons, where the majority of casualties inflicted by the British were from rifle fire, Le Cateau was an artilleryman's battle, demonstrating the devastating results which modern quick-firing artillery using shrapnel shells could have on infantry advancing in the open. The British deployed their artillery in the open, about 50–200 metres (55–219 yd) behind their infantry, while the German artillery used indirect fire from concealed positions. 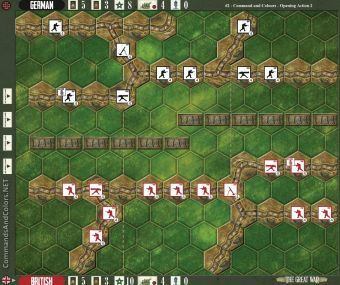 With the guns so close to their infantry, the British had unintentionally increased the effectiveness of the German artillery-fire, because shells aimed at the British infantry could just as easily hit the British artillery. The British 5th Division was positioned on the British right flank, on the southern side of the Le Cateau–Cambrai road between Inchy and Le Cateau. A "hold at all costs-mentality" was evident in the 5th Division on the British right flank. According to the German official history the IV Corps commander, Sixt von Armin, issued an order at 11:15 that turned the regimental- and brigade-level fights into a centrally coordinated battle but there is no evidence of German command and control above the divisional level. 75 percent of IV Corps troops were in contact before they received this order and the rest never made it to the battlefield. The IV Corps commander did not control the other half of the German forces, II Cavalry Corps, which fought independently. Holding their ground despite many casualties, the British right and then the left flank began to break around midday, under unrelenting pressure from the Germans. That night, the Allies withdrew to Saint-Quentin. Of the 40,000 British troops fighting at Le Cateau, 7,812 British casualties were incurred, including 2,600 taken prisoner. Thirty-eight guns were abandoned, most having their breech blocks removed and sights disabled by the gunners first. No trenches, open field, much more faster than the scenarios with trenches. The British troops have some clear advantages, with 3 mortars and positions on the hills. 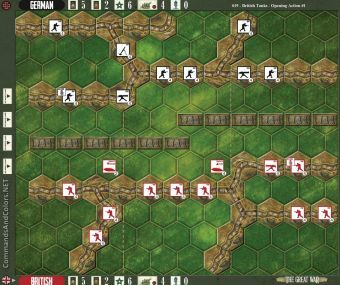 The Germans have to advance very fast and their Left or Right with all the troops (assault). The German MG is too weak to change anything. Reserve artillery may take some hits, but mostly with lucky dice. It is too expensive to being used frequently.